It is also important to realize that a tropical cyclone is not a point. Their effects can span many hundreds of miles from the center. 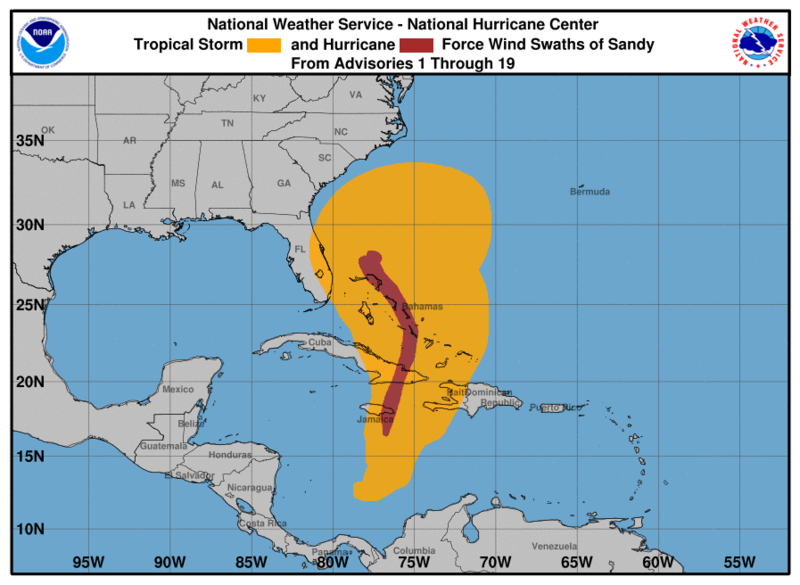 The area experiencing hurricane force (one-minute average wind speeds of at least 74 mph) and tropical storm force (one-minute average wind speeds of 39-73 mph) winds can extend well beyond the white areas shown enclosing the most likely track area of the center. The distribution of hurricane and tropical storm force winds in this tropical cyclone can be seen in the Cumulative Wind History Graphic described below. Considering the combined forecast uncertainties in track, intensity, and size, the chances that any particular location will experience winds of 34 kt (tropical storm force), 50 kt, or 64 kt (hurricane force) from this tropical cyclone are presented in graphical form and in tabular form for selected locations and forecast positions. Graphics for Atlantic tropical cyclones are normally issued every six hours at 5:00 AM EDT, 11:00 AM EDT, 5:00 PM EDT, and 11:00 PM EDT (or 4:00 AM EST, 10:00 AM EST, 4:00 PM EST, and 10:00 PM EST). Graphics for Eastern Pacific tropical cyclones are normally issued every six hours at 2:00 AM PDT, 8:00 AM PDT, 2:00 PM PDT, and 8:00 PM PDT (or 1:00 AM PST, 7:00 AM PST, 1:00 PM PST, and 7:00 PM PST). The graphics also will be updated when intermediate public advisories are issued, and special graphics may be issued at any time due to significant changes in warnings or in the cyclone. Three types of tropical cyclone wind speed probability values are created for each forecast/advisory package, but not all of these values are distributed or placed on the Internet. For each probability value, the event in question is a sustained (one-minute average) surface (10 m) wind speed of at least a particular threshold value (34 kt...39 mph, 50 kt...58 mph, or 64 kt...74 mph) at a specific location. Special graphics may be issued at any time due to significant changes in warnings or in the cyclone. Note: A more detailed description of these probability products is also available. Graphics for Atlantic tropical cyclones are normally issued every six hours at 5:00 AM EDT, 11:00 AM EDT, 5:00 PM EDT, and 11:00 PM EDT (or 4:00 AM EST, 10:00 AM EST, 4:00 PM EST, and 10:00 PM EST). Graphics for Eastern Pacific tropical cyclones are normally issued every six hours at 2:00 AM PDT, 8:00 AM PDT, 2:00 PM PDT, and 8:00 PM PDT (or 1:00 AM PST, 7:00 AM PST, 1:00 PM PST, and 7:00 PM PST). Note: Please read the Tropical Cyclone Surface Wind Field full product description. 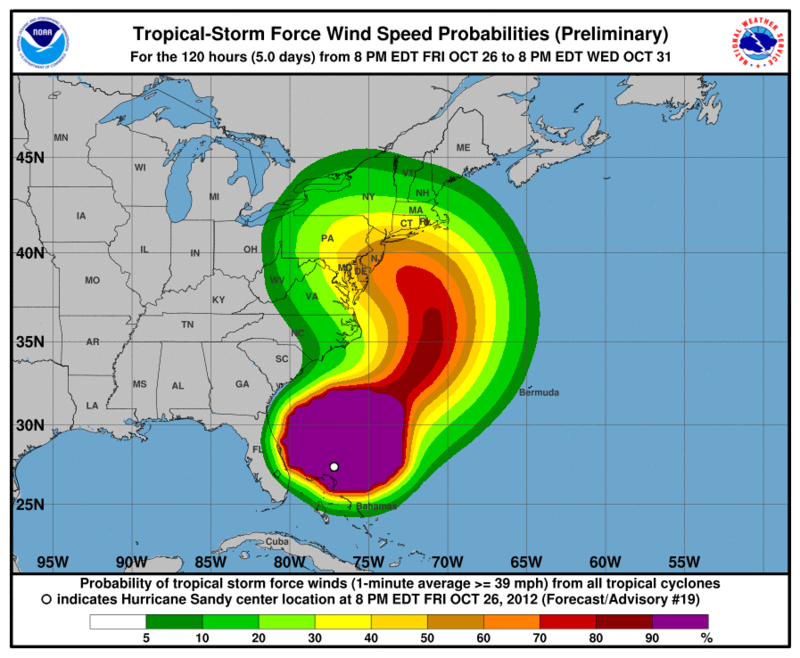 The anticipated arrival of sustained tropical-storm-force winds from a tropical cyclone is a critical threshold for coastal communities. For example, emergency managers use this information to determine when to begin and complete coastal evacuations, while the public needs to know when to prepare their homes or businesses and get supplies. 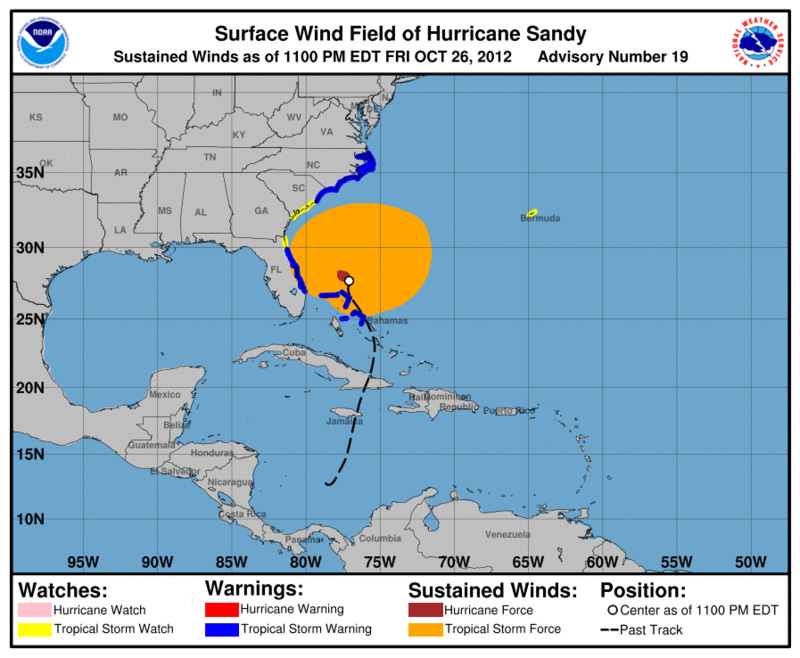 Once sustained tropical-storm-force winds begin, such preparations usually become too dangerous or difficult. Historically, many decision makers have inferred the arrival of sustained tropical-storm-force winds from NHC products deterministically, without accounting for tropical cyclone track or size uncertainty. The risk in not factoring in these uncertainties is that communities may have less time to prepare if a tropical cyclone speeds up or increases in size beyond NHC's initial forecasts. 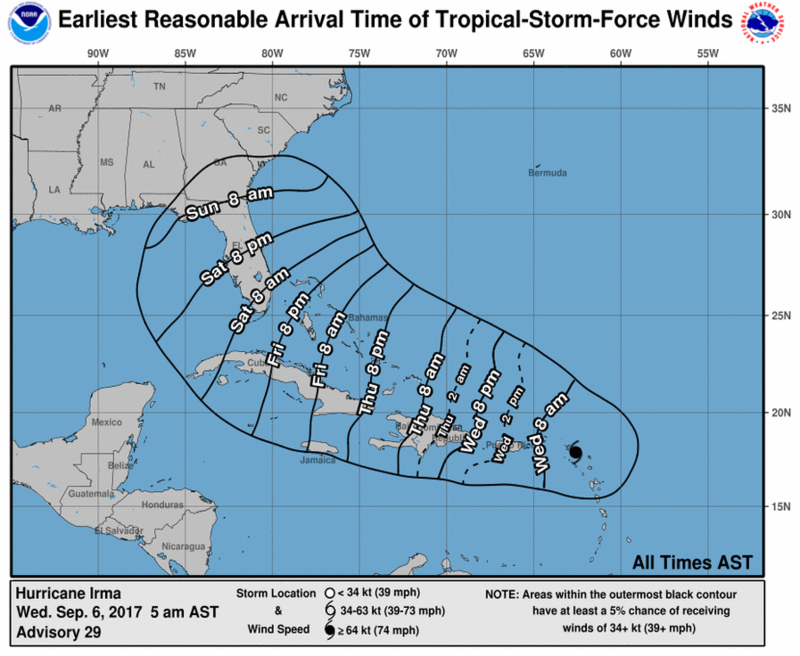 To better meet users' needs, NHC has developed a set of graphics that depict when sustained tropical-storm-force winds from an approaching tropical cyclone could arrive at individual locations. The maps were developed and tested using social science techniques, including one-on-one telephone interviews, focus groups, and surveys with emergency managers, broadcast meteorologists, and NWS meteorologists to gather opinions on the idea, content, and design of the products. Note: A more detailed description of the arrival time of tropical-storm-force wind graphics is also available. Example Graphical Tropical Weather Outlook for the Atlantic basin. 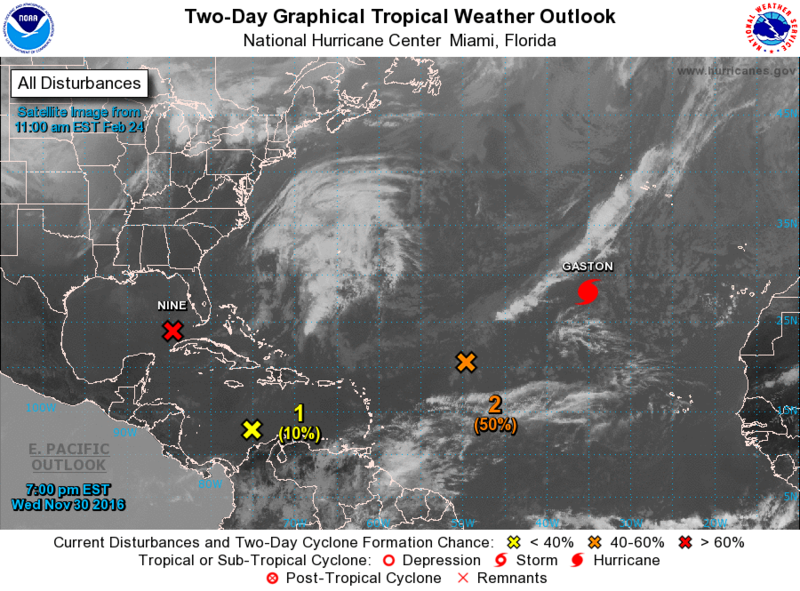 The 2-Day Graphical Tropical Weather Outlook (TWO) depicts significant areas of disturbed weather and their potential for development during the next 48 hours. The 2-Day Graphical TWO also shows the locations of any active tropical cyclones. The location of areas of disturbed weather on the graphic are denoted by an X and numbered, with text discussions for each disturbance given beneath the graphic. The potential for tropical cyclone formation for each disturbance within the next 48 hours will be indicated by the color of the X; yellow indicates a low probability of development (0-30%), orange indicates medium likelihood (40-60%), and red indicates a high likelihood of development (70-100%). The graphic is interactive; users can mouse over cyclones or disturbances in the in the graphic and pop-up windows will appear with cyclone advisory information or the text Outlook discussion for that disturbance. Clicking on a tropical cyclone symbol will take the user to a new web location that contains all advisories and products for the cyclone. Clicking on a disturbance will take you to a zoomed satellite image of that disturbance. Information on the motion and potential impacts of each disturbance is available in the text descriptions but is not displayed graphically. The 2-Day Graphical TWO is usually available shortly after the text TWO has been issued, but occasionaly there might be a slight delay for the updated graphic to appear on the NHC website. For this reason, users are reminded that the text TWO may show updated information a few minutes prior to the 2-Day Graphical TWO. A special TWO may be issued at any time when important changes in areas of disturbed weather over tropical or subtropical waters need to be conveyed before the next scheduled release of the TWO. Note: A more complete description of the Graphical Tropical Weather Outlook can be found here. 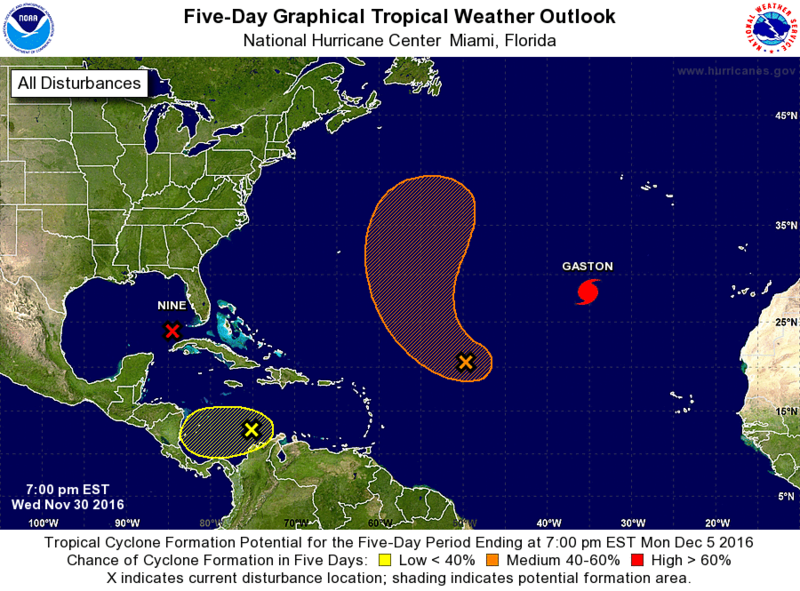 The 5-day Graphical Tropical Weather Outlook (TWO) became operational in 2015. This graphic provides formation potential for individual disturbances during the next 5-day period. The areas enclosed on the graph represent the potential formation area during the forecast period. The areas are color coded based on the potential for tropical cyclone formation during the next 5-days. Yellow indicates a low probability of development (0-30%), orange indicates medium likelihood (40-60%), and red indicates a high likelihood of development (70-100%). The location of existing disturbances is indicated by an X. If the formation potential of an existing disturbance does not include the area in which the disturbance is currently located, an arrow will connect the current location of the disturbance to its area of potential formation. Areas without an X or not connected by an arrow to an X indicate that the disturbance does not currently exist, but is expected to develop during the 5-day period. 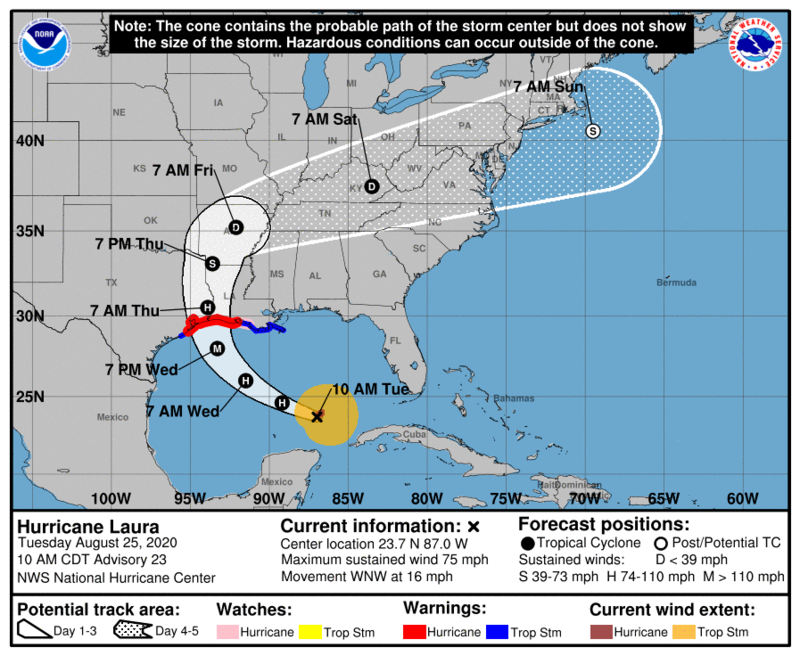 The graphic is interactive; users can mouse over disturbances in the in the graphic and pop-up windows will appear with cyclone advisory information or the text Outlook discussion for that disturbance. Clicking on a disturbance will take the user to a graphic that shows only that disturbance. The graphical TWO is usually available shortly after the text TWO has been issued, but occasionaly there might be a slight delay for the updated graphic to appear on the NHC website. For this reason, users are reminded that the text TWO may show updated information a few minutes prior to the graphical TWO. Example Static example of the Storm Surge Watch and Warning Graphic. Note that the actual product is interactive with pan and zoom capability. Storm surge is rising water moving inland from the shoreline, pushed onshore by the force of the wind. 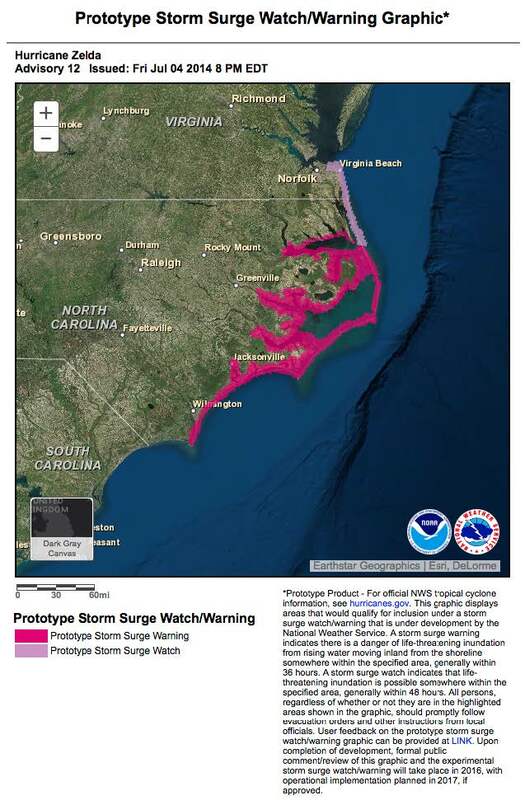 This prototype storm surge watch/warning graphic identifies locations most at risk for life-threatening inundation from storm surge, displaying areas that would qualify for inclusion under a storm surge watch or warning product that is under development by the National Weather Service. A storm surge warning would mean that there is a danger of life-threatening inundation from rising water moving inland from the shoreline somewhere within the specified area, generally within 36 hours. A storm surge watch would mean that life-threatening inundation is possible somewhere within the specified area, generally within 48 hours. Due to forecast uncertainty, the actual areas that experience life-threatening inundation may differ from the areas shown on this map. In addition, during this developmental period, the graphic may not always be available or updated in a timely manner. All persons, regardless of whether or not they are in the highlighted areas shown by the graphic, should promptly follow evacuation orders and other instructions from local emergency management officials. Upon completion of development, formal public review and comment will be solicited for both this graphic and the experimental storm surge watch/warning. The comment period is expected to take place in 2016, with operational implementation planned in 2017, if approved. This graphic is part of the suite of products issued for active tropical cyclones every six hours at 0300, 0900, 1500, and 2100 UTC. NHC will attempt to make this graphic available at those times whenever life-threatening inundation from storm surge is possible along any portion of the Gulf or Atlantic coasts of the continental United States within 48 hours. However, during the developmental period, the availability or timeliness of this product cannot be guaranteed. Note: A more detailed description of the Prototype Storm Surge Watch and Warning Graphic can be found here. 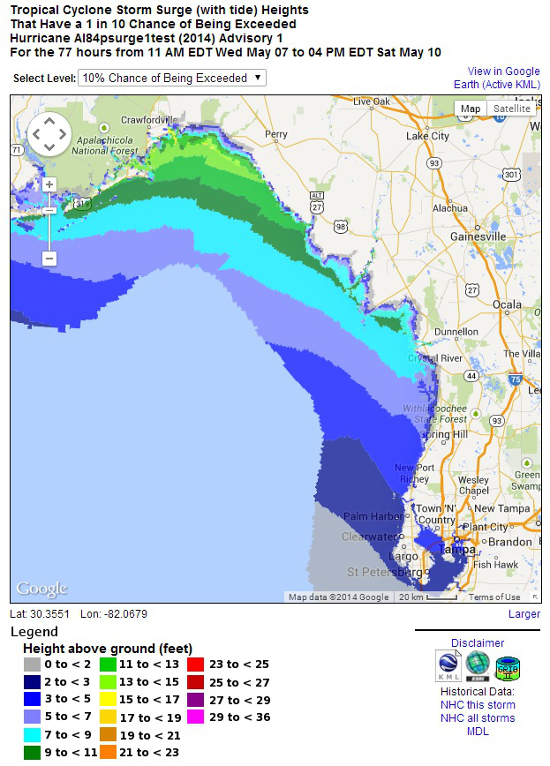 Example Static example of the Potential Storm Surge Flooding Map. Note that the actual product is interactive with pan and zoom capability. The Potential Storm Surge Flooding Map shows geographical areas where inundation from storm surge could occur and how high above ground the water could reach in those areas. The map is based on the latest forecast track and intensity of the tropical cyclone, and takes into account likely forecast errors. The shading represents inundation levels that have a 10 percent chance of being exceeded, which can therefore be thought of as representing a reasonable worst-case scenario for any individual location. The first map will usually be issued at the same time as the initial hurricane watch, or in some cases, with a tropical storm watch. The map is subject to change every six hours in association with every new NHC full advisory package. This graphic is part of a suite of products issued for active cyclones every six hours at 0300, 0900, 1500, and 2100 UTC, whenever a hurricane watch or hurricane warning, and in some cases, a tropical storm watch or warning, is in effect for any portion of the Gulf or Atlantic coasts of the continental United States. Due to the processing time required to produce the map, there will generally be a delay of an hour or more in the posting of this graphic to the NHC web site, or soon after the availability of the Probabilistic Tropical Cyclone Storm Surge and Tide products. Note: A more detailed description of the Potential Storm Surge Flooding Map can be found here. An interactive example of the Potential Storm Surge Flooding Map can be found here. Example Static example of the Probabilistic Storm Surge Heights output. Note that the actual product is interactive with pan and zoom capability. The Tropical Cyclone Storm Surge and Tide Probabilities graphics depict the likelihood that a storm tide will occur at particular locations during the next 78 hours, specified in one-foot increments from 2 to 25 feet above ground level or above the North American Vertical Datum of 1988 (NAVD88). The probabilities are based on an ensemble of Sea, Lake, and Overland Surges from Hurricanes (SLOSH) model runs using the NHC official advisory and account for uncertainties in forecast track, size, and intensity errors based on historical errors. Additional information on the SLOSH model can be found at: https://www.nhc.noaa.gov/surge/slosh.php. It is important for users to realize that probabilities that may seem relatively small (e.g.,5-10%) may still be quite significant. Users are urged to consider the potentially large cost (in terms of lives, property, etc.) of not preparing for an extreme event. The emergency management community is the primary target audience. However, this product will also be widely used by other federal, state, and local government agencies; the media; maritime interests; and the general public. The product is available on the NHC website when a hurricane watch or hurricane warning is in effect for any portion of the Gulf or Atlantic coasts of the continental United States. Updates to the product are produced about one hour after the issuance of routine NHC tropical cyclone advisories at 5:00 AM EDT, 11:00 AM EDT, 5:00 PM EDT, and 11:00 PM EDT (or 4:00 AM EST, 10:00 AM EST, 4:00 PM EST, and 10:00 PM EST). The data are available in GRIB2 format in the National Digital Guidance Database (NDGD) via HTTP and FTP. More probabilistic surge products can be found at MDL's web page. Note: More information on the Tropical Cyclone P-SURGE graphics and model model can be found here. 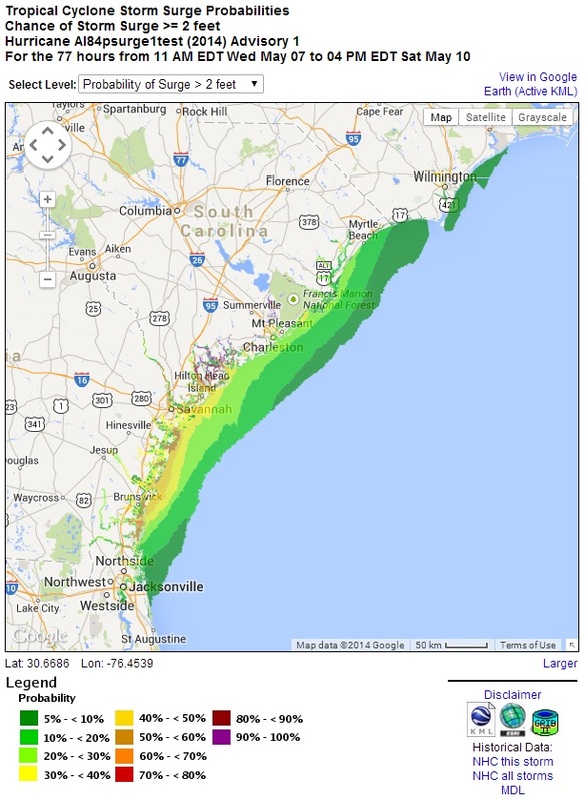 Example Static example of the Probabilistic Storm Surge Exceedance output. Note that the actual product is interactive with pan and zoom capability. 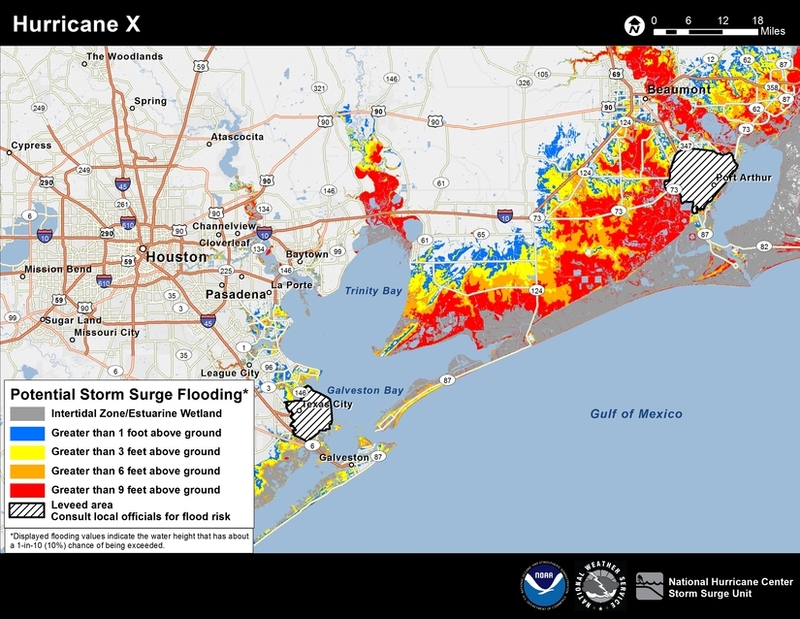 The storm surge exceedence height graphics show the storm surge and tide height, in feet above ground level or above the North American Vertical Datum of 1988 (NAVD88), which has a specific probability of being exceeded in the next 78 hours. The available probability thresholds range from 10 to 90 percent at 10 percent intervals. The storm surge graphics are based upon an ensemble of Sea, Lake, and Overland Surge from Hurricanes (SLOSH) model runs using the National Hurricane Center (NHC) official advisory and account for track, size, and intensity uncertainty from historical errors. Additional information on the SLOSH model can be found at: https://www.nhc.noaa.gov/surge/slosh.php. This graphic is created by the NWS/NCEP Weather Prediction Center (WPC) and shows rainfall potential for the United States when a tropical cyclone threatens land. The graphic is displayed as a Quantitative Precipitation Forecast (QPF), which shows rainfall totals for a specified time period, based on forecaster discretion. For more rainfall information, visit WPC Quantitative Precipitation Forecasts.